It’s tempting to observe that Mr. Amis appears to have already suffered “the serious brain injury” of which he speaks. To suggest that only brain damage could enable him to write for children implies that children are brain-damaged adults; to claim that writing for younger readers is writing “at a lower register” betrays an astonishing level of ignorance about the field. Since both notions are demonstrably false, perhaps we should both wish him a speedy recovery, and advise him to take better care of that head of his. Indeed, one might say that, given the pervasiveness of the injury he’s evidently suffered, the real news here is that he’s able to form complete sentences on his own. Remarkable! 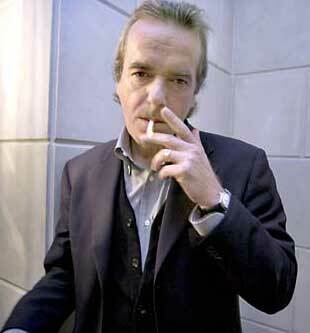 Photo of Mr. Amis from Magic and Lies. Update, 13 Feb. 2011, 11 am: Patricia Storms’ Only a Brain Injury Could Make Me Draw Martin Amis (on her BookLust blog) features caricatures of Amis as the Cat in the Hat, Max, Madeline, the Pigeon, a Moomin, and others. One of those caricatures is, I think, ideal to accompany my particular blog post — as it combines both Amis and Seuss. I refer, of course, to her Amis as Grinch (at right)! So. Go and amuse yourselves with her art. Well said, Philip. I’ve tweeted this. Good addition to the Amis debate. I think it’s adorable when people talk about not paying attention to audience when they write. It makes me want to pinch their little cheeks. Isn’t it just the *cutest* when the little darlings speak as though there weren’t a century of linguistic and semiotic research from multiple continents demonstrating that communication always happens in a context, in the space created by the codes of meaning-making and -reception between speaker and interlocutor, and that the idea of anyone *ever* speaking or writing without a notion of the codes used by the audience is patently absurd? 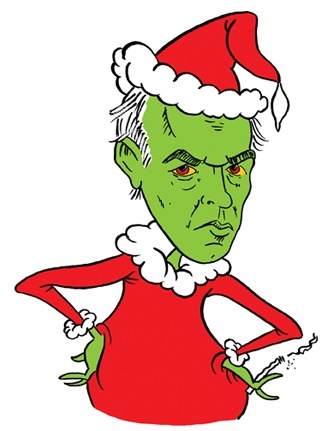 Someone should give Martin Amis a lollipop. I have an idea for where they can put it. Some of the world’s best books were (and are) written for children and about children. Little Women, Tom Sawyer, the Chronicles of Narnia, The Giver, A Wrinkle in Time… how I could go on. I work at a public library, and we’ve just ordered the top 10 best books for young adults, as named by Library Journal. Many of these books are Newberry or Coretta Scott King award winners, and they bring smart and fresh ideas to the table: everything from a boy who repairs sleep in The Seems to a girl who survives Hurricane Katrina in Ninth Ward..
I’m sorry Amis is missing out on these books, because they look amazing. And, Joe: yes, my first response was also irate. When (above) I advise against thwacking Mr. Amis in the head, I’m really arguing with myself. While an Amis head-thwacking would be an interesting experiment, I’ve decided that it is better to pity the willfully ignorant. I think of the maxim “There is no one so deaf as one who will not listen” — a maxim that describes Amis perfectly. When we abandon our childhood, and pretend that adulthood is all there is, we are aware of a bitterness that some would call the seed of literature, but I just call bitter. I think it’s worth separating the ugliness of his “brain damage” response from the rest of his explanation. The latter opinion, while groan-inducing, doesn’t outrage me any more than a blowhard at a dinner party. Mainly because I don’t think he was speaking to the reading world; rather, I think his comment is about process. He seems to believe that bringing a phantom audience or language/content restrictions into the process would cause irrevocable damage to HIS work. I can’t tell him he’s wrong there. Could he have been more tactful in his expression of this belief? Most definitely. I, for one, find it delightfully ironic that he got into this mess because he failed to consider his audience before speaking. I think you’re likely correct, Jonathan: he is talking about process. Furthermore and for the record, Mr. Amis is indisputably an important and talented writer. However, precisely because he is such a writer, he of all people should know that words matter. Given that words are what he does for living, one expects better from him. Or did expect better, anyway. I too think he’s talking about process. But it just goes to show that the intentional fallacy is still good to keep in mind when attending to writers talking about what they do. The idea that Amis sits down to write without being “conscious of who [he’s] directing the story to” is as ridiculous as his corollary claim that “fiction is freedom and any restraints on that are intolerable.” As if Amis sits down and starts writing without knowing whether he’s working on a book review, a novel, a book-length work of non-fiction, etc. etc… Even if he starts a piece of prose fiction unsure of whether it will develop into a novel or a short story, I’m sure he’s aware of what it might become, and doubtlessly he modifies his approach and revises what he’s written as one form or another becomes more likely. That kind of awareness comes along with an awareness of literary history, of the kinds of readers he’s likely to have, the responses critics have had to previous works of a similar type (whether by him or by others), etc etc (again). Also, conventional English sentences restrain our “freedom” as much as the formal requirements of realist fiction broadly conceived, as do, more narrowly, the novel or short story forms. There are reasons he might choose, say, the novel form to cast his narratives in, as opposed to long poems in dactylic hexameter, and “freedom” is low on that list; awareness of his audiences, I imagine, is much higher. So he’s not only willfully about children’s literature, he’s also willfully ignorant (or purposely Romantic) about the nature of writing itself. Which is all to say, “Yes, Joe SS,” you’re absolutely right. This all brings to mind Raymond Queneau’s characterization of the Oulipo, which he co-founded: Oulipians are “Rats who build the maze from which they will try to escape.” The best writers–or, better, the ones I find most interesting–are those who are aware of the constraints that make any art possible, work within those constraints complexly, and even engineer additional constraints which they follow rigorously. Freedom? Bah! This is just an example of how very clever people think they’re perfectly justified in despising our subject openly. At every Formal dinner I go to there’s always one of them and it gets tiring to have to justify myself that I’m doing children’s lit. The other day it was a smug Pharmacologist who asked me slowly and smilingly (he probably thought I had brain damage) for an interpretation of Enid Blyton’s books. And then: ‘So how did you end up doing this then?’ as if all paths in life that didn’t lead to Pharmacology were mysteriously deviant. In my comment above, please insert the word “ignorant” between the words “willfully” and “about.” You’ll find those two words, back to front, in first sentence of the penultimate paragraph. Of course, you can’t actually revise the sentence in question, so you’ll have to rely on your imagination. When rereading (if you find yourself compelled to do so) the language in question–the first sentence of the third paragraph of my previous comment–keep the instructions above in the back of your mind. When you arrive at the second-to-last paragraph (previously referred to as the “penultimate” or “third” paragraph), think quietly to yourself, “Ah! Here comes the mental edit Joseph remarked on in his second comment.” Then begin reading said sentence, aware that when you come across the word “willfully” you should pause, think the word “ignorant,” and then continue reading in the conventional fashion. You’ll find, I think, that making this correction will clarify the meaning of my previous post while also providing you some degree of personal satisfaction. If you don’t feel any satisfaction from making the correction, remind yourself how perfectly you followed these instructions. That will do the trick. Satisfaction guaranteed. Okay, the correction following the colon at the end of the first paragraph of this comment isn’t what most of us would call brief, and, perhaps, it’s not very clear either. But this is a blog comment, and blogs (and blog comments) are held to a lower standard than other forms of written expression. They are (how can I put it?) “at a lower register” than other forms of prose, and, in that, are similar to children’s literature. So get off my back already!